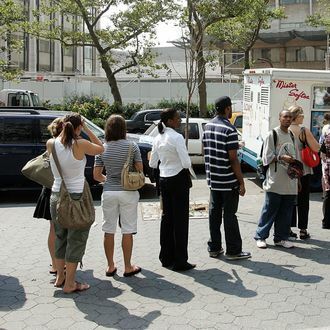 We’d like to think that a Mister Softee driver could trust his fellow Mister Softee drivers — that the experience of listening to that same tinkling music and dipping swirls of soft-serve into chocolate every day of New York’s miserable summer would create a sweaty, swirled, unbreakable bond. Unfortunately, the New York Times reports, that’s not the case: In the middle of an early April night, someone stole over a thousand dollars worth of quarters and bills locked in the trucks parked in South Ozone Park’s Mister Softee lot. The thief, who can be seen briefly on security footage, knew what he was doing: “He went behind the trucks so the camera would not see him,” said Harish Kumar, who owns the lot and four Mister Softee trucks. “Only someone who knows the business would know,” said Henry J. Murphy Sr., a 32-year Mister Softee veteran. “A guy who used to work with Mister Softee,” Kumar concurred. The Times also reports that, a few weeks later, a masked man pulled off a similar heist at a Queens Village Mister Softee lot, though drivers wisely only kept quarters in their trucks. As their busy season approaches, it seems that the rest of New York’s Mister Softees should do the same.